Eligibility: Any music student living in Miami-Dade County or who studies Music in Miami-Dade County who has not yet graduated from High School is eligible to audition for the Coral Gables Music Club Scholarship Committee. Being selected is prestigious for both the student and the teacher. Winning a scholarship increases the students’ confidence and self-esteem. We also promote students in concerts, support them in competitions and encourage them in preparing for a career in music. Scholarship Payments: Scholarship payments are sent directly to the teacher in two payments. The Scholarship Award ranges from $200 a year to $600 a year. Funds: Funds are raised through fundraising events and from donations, bequests and legacies. 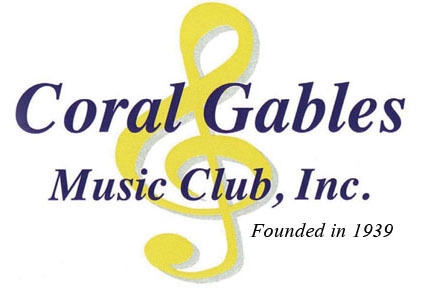 Members of the Coral Gables Music Club are strongly urged to support fundraising events, since awarding music scholarships is one of our club’s most important functions. Please be generous when you attend events. Tomorrow’s music depends on your generosity today. Scholarship Endowment Fund: This fund has been provided by generous benefactors and only the interest will be used. Where are they now? Our former scholarship students are working in every field of music. Over two dozen are on University Music faculties and many others teach privately. Many more are members of large, firstrate symphony orchestras around the globe, several well-known concert artists, some working in Broadway Musical Theater, jazz artists, composers, arrangers, opera singers. There is a Toni Award winner among this elite group and another received the Duke Ellington Award as the finest young pianist of jazz in the nation. Coral Gables Music Club is proud to have had a part in helping these young musicians attain their goals.